The crossover SUV gets updates inside and out, as well as a special Yellow Night Edition of the Mercedes-AMG GLA 45 4Matic. Mercedes-Benz has revealed a facelift for its small crossover SUV, the GLA. Revealed at the Detroit Auto Show, the revised model boasts styling tweaks both inside and out. 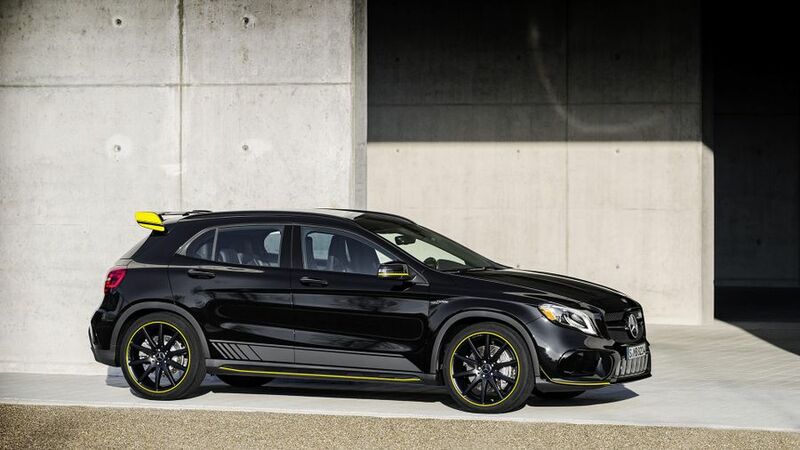 A special edition version of the range-topping Mercedes-AMG GLA 45 4Matic has also been unveiled, called the Yellow Night Edition. Visual changes to the GLA include modified bumpers and new alloy wheel designs, as well as a new colour called Canyon Beige. The optional bi-xenon headlights available on the outgoing models have been replaced with LED units, and all cars have LED tail lights that automatically vary in brightness depending on the time of day. A 360-degree camera – which Mercedes says is an exclusive feature in this segment – shows the surroundings of the car on the media display inside, and can also show a birds-eye view from the front, side and reversing cameras. Interior tweaks include new seat covers and trim elements, as well as chromed control panels and electric seat adjusters. There’s more chrome around the centre console stowage compartment, and the dashboard has new dials with red needles. Other new additions include hands-free access to the boot, which means it can be opened with the wave of a foot. UK cars will have off-road comfort suspension as standard, which raises the GLA 30mm higher than the comfort chassis. A lowered suspension is also available with AMG Line cars, or those equipped with the Dynamic Handling package. Mercedes says it has re-profiled the GLA’s aerodynamic elements, including the front apron and roof spoiler, to increase driving dynamics and stability, while also reducing wind resistance. Pushing out 376bhp from its turbocharged, 2.0-litre engine, the top-of-the-range GLA 45 4Matic will hit 62mph from standstill in 4.4 seconds. It too has had a front-end refresh, with a radiator grille and side sill inserts finished in silver chrome. A new 20-inch light-alloy wheel is available as an option, available in matt black with a high-sheen rim, or titanium grey with a high-sheen finish. Opt for the AMG Dynamic Plus package and you’ll get a mechanical locking differential, as well as AMG Ride Control sports suspension, a performance steering wheel and a Race mode option. The Yellow Night Edition spec is available on the GLA 45, as well as the CLA 45, CLA 45 Shooting Brake and A45. Finished in Night Black or Cosmos Black with matt graphite grey and yellow detailing, they come with matt black and yellow rims, and a black-painted AMG twin louvre in the bonnet. Inside, the leather and microfibre seats are trimmed in yellow, as is the steering wheel and the dashboard. The door sill panels are finished in graphite grey with a yellow AMG logo, and the floor mats and air outlets have yellow accents too. All Yellow Night Edition cars come with the Aerodynamics package, the Night package, and the Light and Sight package included. You can also order your car with the AMG Dynamic Plus Package. The new GLA is on sale now, with the first cars arriving in April. We expect prices to stay relatively stable, starting at around £26,000, but expect to pay north of £55,000 for the GLA 45 4Matic Yellow Night Edition. 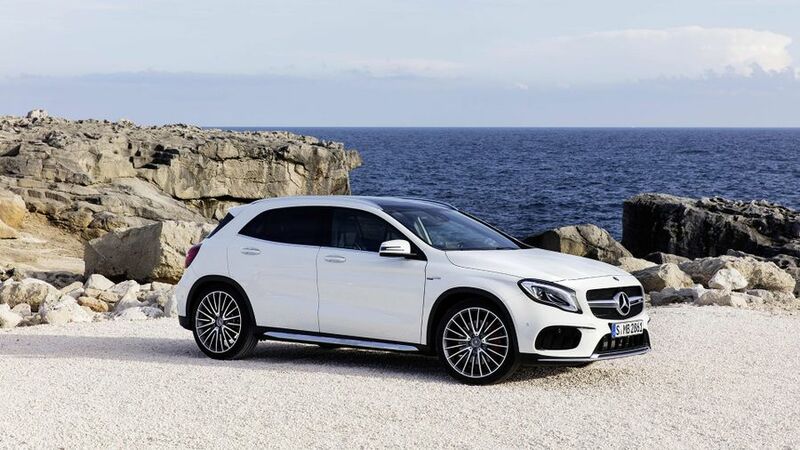 Interested in buying a Mercedes-Benz GLA Class?